Yesterday, we made it a point to finish all the various leftovers in the house, so no bentos to show. While leftover chicken enchiladas still taste yummy, they aren't great to look at, so no pictures to be had. Today, however, was bento day again! Ben has a meatless Monday meal, but on a Tuesday. ;o) He has cream cheese and strawberry jam mini-pita sandwiches, topped with a cheddar train with muenster wheels. To the left, there's a sliced boiled egg and a few carrots, then strawberries, pineapple, blueberries, and a mini banana muffin. Thinking about trying a few more meatless meals in the mix for the kids and I. The three of us don't miss it (Shaun will), so it will have to be lunches for now. Looks yummy! What box is that? It's a KungFu Panda box that I think is from Tupperware. 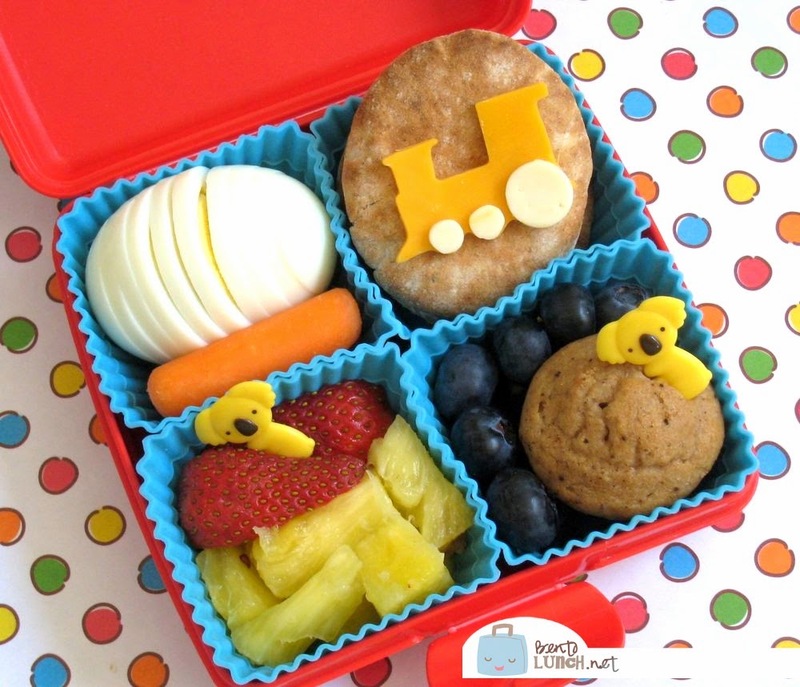 It's supposed to be a sandwich box, but with a few dividers, it makes a great bento! I love the square muffin cups -- I've been trying to find those; the round ones just don't fit perfectly in my boxes. Rachel, my JoAnn Fabrics sells the square muffin cups. Don't forget your coupon! I got mine at Michael's, I think, one of those crafty type stores. :o) They're Wilton brand, so you should be able to find them without too much trouble (I hope!). Looks delicious! And yes to Koala Brothers! Kidlet loved that show!